Game of Thrones, the series of the HBO chain that this Sunday issues the first chapter of its final season, is considered one of the best TV fantasy series of all time. However, when reviewing many of his stories and characters from this series that adjusts eight seasons, it is possible to affirm that he has been much closer to historical reality than to the author’s imagination. Its creator, the American writer George RR Martin, author of the books on which the series was based, has never denied this influence: “I’ve always liked the story, but a more popular version, not that about data, censuses or cultural changes but the one that focuses on the stories of wars, intrigues and murders, “Martin told the British newspaper The Guardian. And that led him to create several of the moments that today are considered jewels of television, such as the scene of “The Rains of Castamere” or the imposing wall of ice that protects the world of men. All of them have a basis in real events or historical accounts. At Rava here we tell you five historical facts that could serve as inspiration for the best moments of Game of Thrones. It is very difficult to summarize in a single paragraph such a long and complex conflict as the War of the Roses, which was fought between the Lancaster and York families for the throne of England in the fifteenth century. 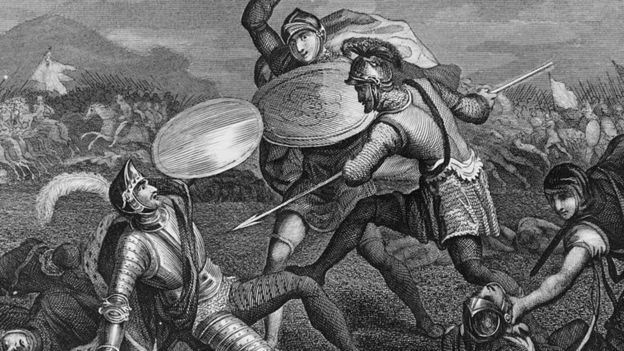 Image caption The death of Richard III – member of the House of York – at the Battle of Bosworth. However, basically it is the struggle of two families for a throne. 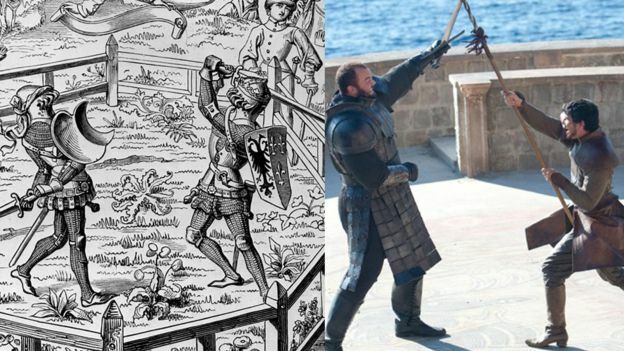 Martin – who read the four volumes of “Plantagenet,” the book by the historian Thomas B. Costain that tells how wars and confrontations occurred during those years – relied on that internal conflict to describe the Lannister’s struggle (quite similar to the Lancaster, by the way) and the Starks (who sound almost like York) by the power of Westeros. It was at this stage of universal history that things were seen as baby kings, manipulative mothers, charges such as “the hand of the king” (in real history he would be called “Protector of the Kingdom”) and a kingship in exile that he also claimed his right to the throne (and that he finally gets the crown of England: with the arrival of Enrique Tudor, whom history will know as Henry VII ). All that is replicated in the television series. Tyrion Lannister, the character played by the American actor Peter Dinklage, is accused in the first season of killing Lord Jon Arryn – one of the lords of the regions within Poniente – and he surprisingly goes to the figure of the trial by combat to evade the sentence against him. Image caption Those involved in the case hired swordsmen to fight for them and thus decide the litigation that justice could not resolve. That is, choose your bodyguard, Bronn, to be your “champion” and fight for him in the arena of combat. The premise is that if Bronn wins the fight – which eventually happens – Tyrion can be free of all guilt. This figure is not the product of imagination: in medieval Europe it was a very popular mechanism to settle some legal conflicts, especially when the judge could not reach a final decision. 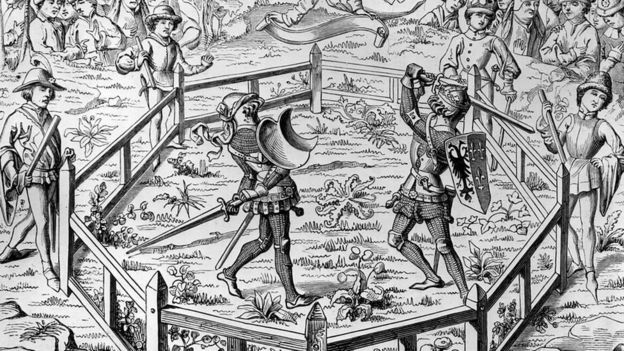 Then, the opposing parties could choose their respective swordsman or combatant -who was hired by some coins- , who faced each other to determine who was the winner of the dispute. Unlike what is told in the series, these combats did not end with someone dead, much less with the brain destroyed, but usually won by those who forced the other to surrender. It is undoubtedly one of the most unpredictable and shocking moments of the entire series: when, in a single chapter, three of the main characters die. Image caption The red wedding is one of the most remembered scenes in the eight seasons of Game of Thrones. 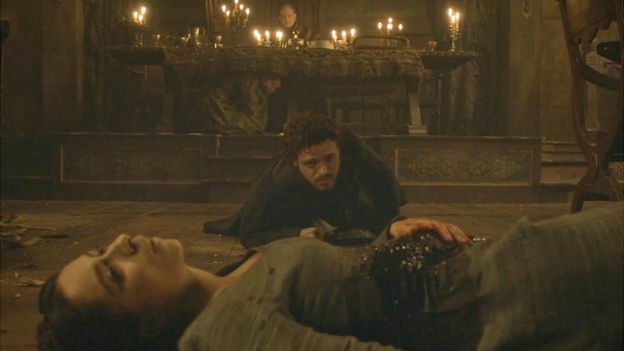 In chapter 9 of the third season, Robb Stark, his fiancee Talisa (who is pregnant) and her mother, Catelyn Stark, are killed in the middle of a banquet offered by Lord Walder Frey, whose daughter had been offered in marriage and rejected by Robb Stark. Martin himself accepted that the scene had been inspired by a moment in Scottish history, which also has a colorful denomination: the black supper . “The black supper refers to the fact that it happened in 1440, when the advisors of the King of Scotland James II (who was 10 years old) invited his rival for the throne, the Earl of Douglas (who was 16), to a dinner in His castle, they offered to spend the night with all the guarantees, “Martin told EW magazine . “The historical account indicates that, after a few quiet moments, several drums rang and put the head of a black boar on the table of the guests, the sign of death.” Then, the count and a brother were taken to a tower and later they were beheaded, despite the pleas of King James to not do so, “he added. The Wall is one of the places of “Game of Thrones” where are located several of the darkest and most complex frames of the series. According to the description of Martin in his book, the Wall has an area of 420 kilometers and a height of 213 meters and serves to protect the seven kingdoms of the so-called savages and the “Others” (white walkers). Image caption Hadrian’s Wall was built in the second century to protect Roman Britain from the tribes of northern Britain. It is guarded by what is known as the ” Night’s Watch “, warriors who swear to protect the world of men from external threats. One of the protagonists belongs to that group, Jon Snow. 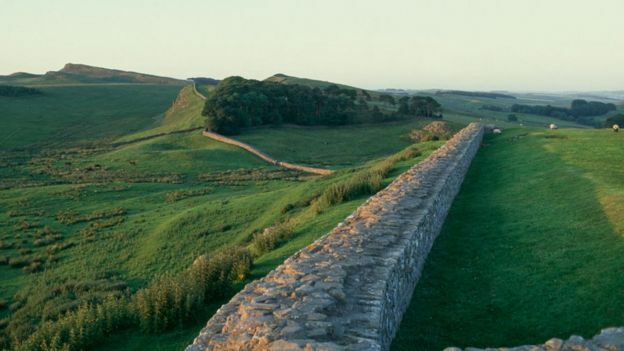 Well, that Wall has its inspiration in a less imposing one, but one of great historical importance: the Hadrian’s Wall, which was built to protect Roman Britain from the tribes in the north of Great Britain, which later became what which is known as Scotland. Martin was inspired by this structure – which was built by the Roman emperor Hadrian in the second century, hence its name – when he visited the north of the United Kingdom in the 1980s. “I was in England visiting a friend and they took me near the border with Scotland, where we stopped to see the wall of Hadrian,” he told Rolling Stone magazine . “I stopped there and I kept thinking about what life would be like for a Roman legionary who had to spend his life looking in the distance of those hills,” he added. At the end of the first season one of the most impressive moments of the series occurs. It is in the sixth chapter when Viserys Targaryen, the ambitious brother of Khaalesi or the “Mother of Dragons”, asks Khal Drogo for the “crown he had promised” by the hand of his sister. Image caption Emperor Valeriano led Rome for almost seven years. All this while threatening with a sword the baby that she carries in her belly. Then Drogo, weary of the situation, orders that they hold Viserys by the hand while he melts his golden belt in a pot, then proceeds to pour the hot metal over the head of his superb brother-in-law, which ultimately causes his death . 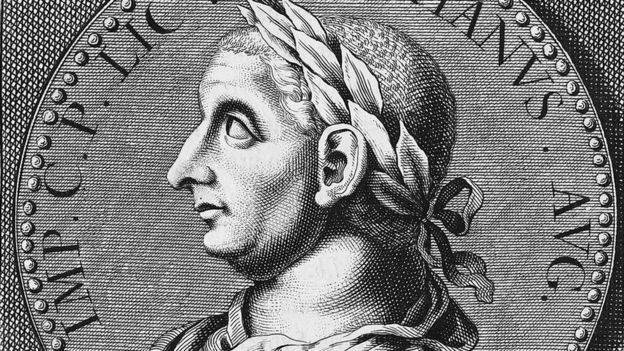 Well, some similar situation, according to some historical accounts, happened to the Roman emperor Publio Licinio Valeriano . After being captured in the year 260 by the Persian king Sapor I, he was forced by it to swallow molten gold, among other humiliations. Then he would be executed. However, the veracity of this story is questioned by many historians without reaching a consensus conclusion on how the end of Valeriano was.